Developer, Atomicom, and publisher, GamesCo have released the latest feature JCB Pioneer: Mars video outlining what players can expect in the upcoming sci-fi survival sandbox! JCB Pioneer: Mars begins as the player awakens from a crash, surrounded by the wreckage of their Lander vehicle amidst falling debris and hurtling winds. Survival is the first goal - locate oxygen and establish an outpost. 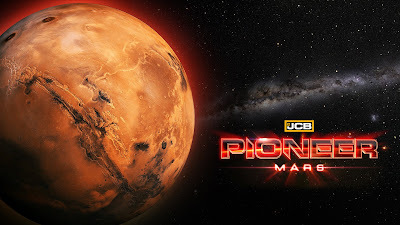 As the player slowly begins to establish him or herself on Mars, learning to combat the planets fierce and hostile weather patterns, they begin a larger operation of colonisation. Life-support infrastructure is crucial but so is mining natural resources, as part of a broader mission to save an ailing Earth. Equipped with the futuristic, heavy-duty construction and mining vehicles designed in collaboration with JCB’s industrial design team, every would-be astronaut has a chance of surviving and thriving in the face of extreme planetary challenges.